Leo van der Veen's ingenious app lets you turn any scannable product into an augmented-reality musical instrument. Those ubiquitous QR codes may get all the trendy tech love these days, but the humbler Universal Product Code - or barcode, as it's better known - has some creative life left in it yet. An iPhone app called Barcodas turns any UPC code into a electronic instrument: just scan it with the iPhone's camera, and those black bars jump to musical life like a tiny player piano. Since almost everything on earth has one of these barcodes pasted on it somewhere, you'll never be at a loss for musical inspiration. Software designer Leo van der Veen got the idea for Barcodas while staring at a barcode over breakfast, idly adding and subtracting the digits in his head. "I play with numbers all the time." he tells Co.Design. "Projecting the barcode digits on a harmonic scale just sounded like fun to me, having a background in sound & music technology." His app maps each barcoded digit to one of eight notes in the C major scale (that's the white keys on a piano, for us non-musical types). "To make the barcodes sound more interesting, I decided the 0's would be rests, [so that] rhythms are generated," he adds. "The 9 equals the D note, only an octave higher." 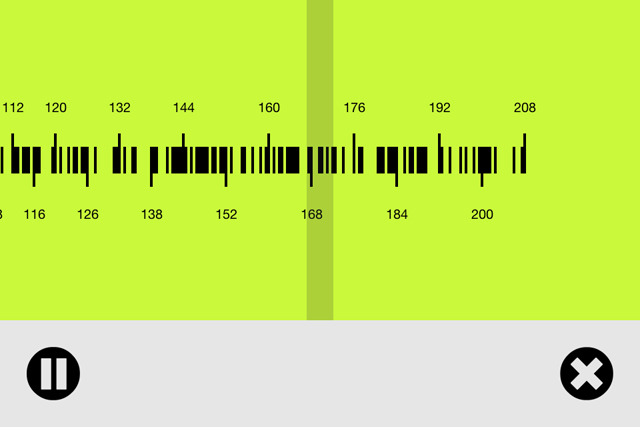 Barcodas blindly converts each UPC code into a short musical loop, which could get boring fast - but van der Veen has built some clever interactions into his app. A row of icons across the top edge of the interface lets the user modify the harmonic scale with a simple swiping motion (if you want to throw in some black keys to change things up), change the tempo of the playback, or share your generative musical creation with friends on Facebook. Van der veen says his app might also work on trendier QR codes, but "it's really not interesting since they are not human readable in the way barcodes are," he says. In other words, anyone could "read" the musical information in a barcode if they wanted; Barcodas just automates the process. "I see it as a nice way to play with a system that is used worldwide, we can hardly live without and just take for granted," he says. "It's just making millions of tunes audible, without any judgment whatsoever." How democratic!